Today's Free GM Resource is a pretty cool site that exists to help GMs create official-looking home-brew rule pages for D&D 5th Edition. Homebrewery is a pretty cool site and just because it is designed for one edition it doesn't mean you couldn't use it as a tool to create pages for your own preferred system. 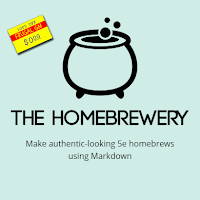 Homebrewery allows you to share the created pages, either as read-only, or even to allow multiple collaborators.